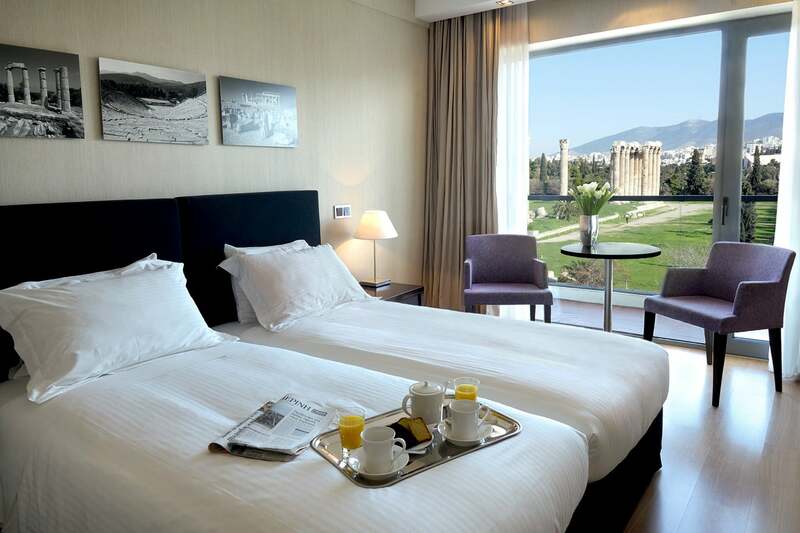 The Hotel is placed in the historic district of Athens, directly opposite of the Temple of Olympian Zeus. 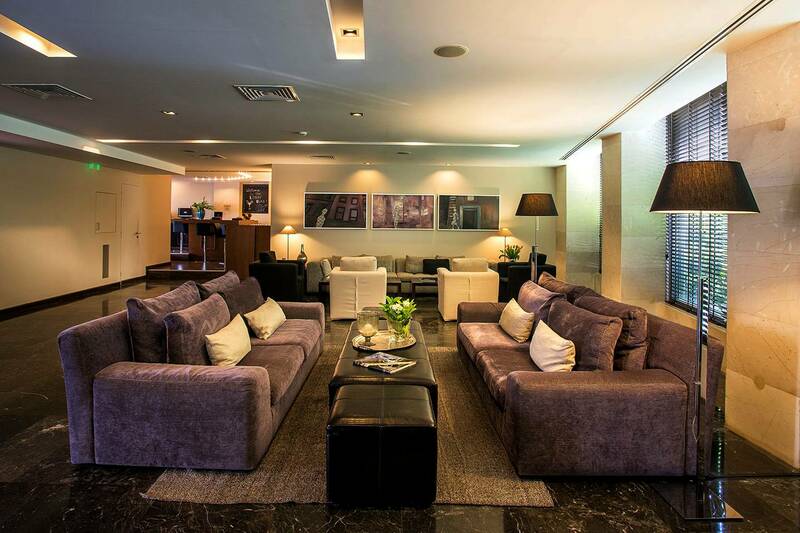 With very easy access, the hotel is located 500 meters from the Acropolis and 100 meters from the New Acropolis Museum. Constitution Square (Syntagma) and the commercial center of Athens are also only 500 meters away. 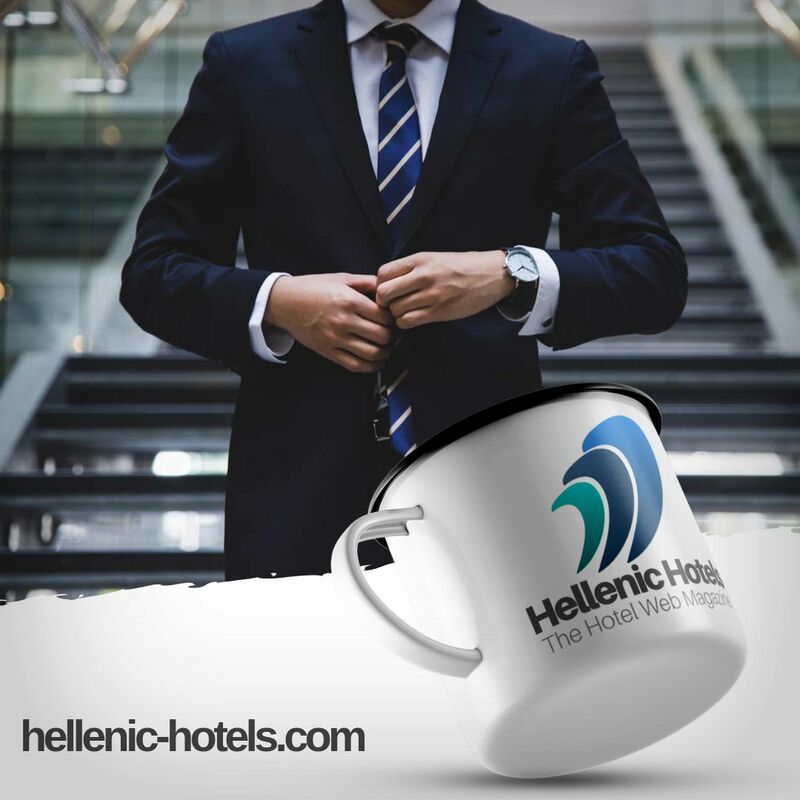 The Hotel is located in the historic district of Athens, directly opposite the Temple of Olympian Zeus and the Gate which was constructed by the Athenians to welcome the Roman emperor Adrianos (Hadrian). On the right side of the Hotel, a sculpture by Nikos Alexiou (who represented Greece in 2007 at the Venice Biennale), symbolizes the hotel’s unique and modern character. The sculpture which is 18,5 X 4,5 meters portrays a woman’s veil and is named “Peplo tis Amalias (Amalia’s Veil). 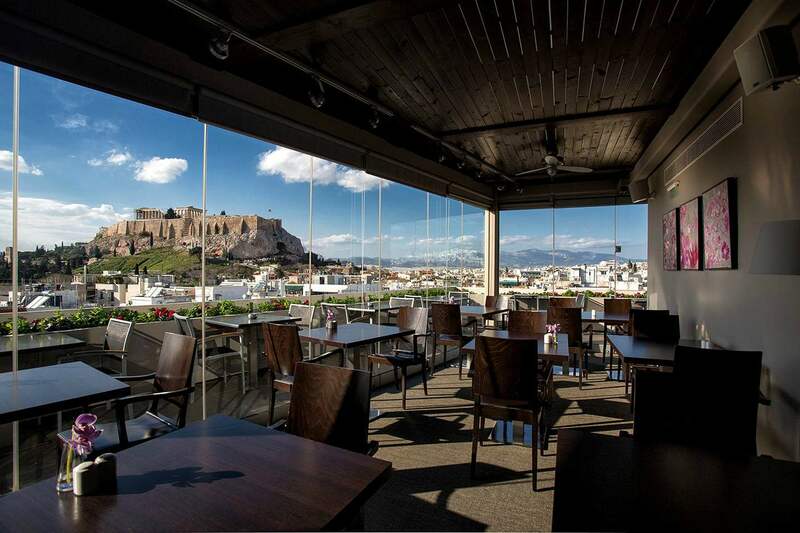 Elegant & sleek, decorated in simple modern lines, the Athens Gate Roof Top Bar boasts the 4th best Roof Top View in the world, according to TripAdvisor. 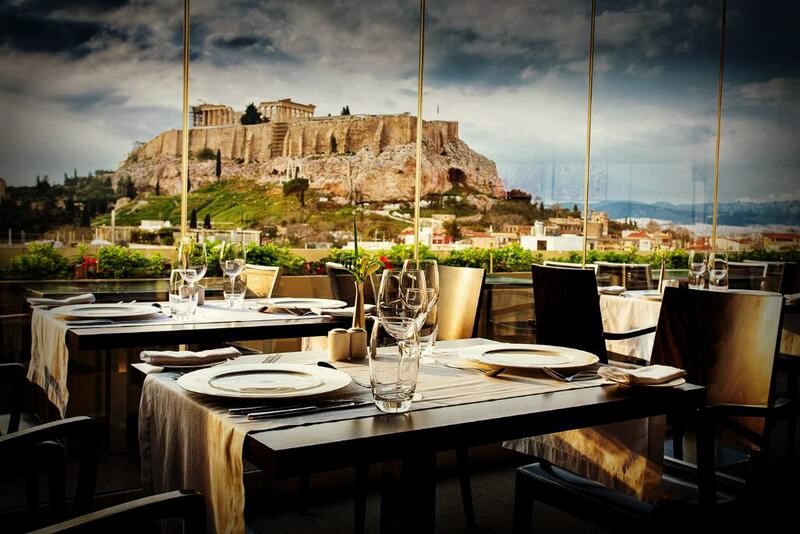 Located on the 8th floor, the bar has one of the best outlooks of the Acropolis Hill, Temple of Zeus and Athens. Paired with fine Greek wines and carefully executed cocktails, guests can enjoy the perfect scenery for relaxing with a once in a lifetime view. The Athens Gate Hotel proposes one meeting hall, located on the mezzanine floor of the building, bathed in natural day light and fully air conditioned. This multifunctional space can be transformed into a theatre-style venue for 100, a U-shaped event or boardroom for 50, and a Classroom set up for 60. A foyer area and restrooms complete the luxurious service. The hall is equipped with Data Projector, Screen 2×2, two wired desk top microphones, white board and free wi-fi Internet. For a corporate dinner, lunch or cocktail reception with once in a life time view, please visit also “Dinning & Bars”. The Budget Room is a twin-bedded room with a bathtub, similar to the Standard Twin Room, with internal views and no balcony. The room rate includes American buffet breakfast, all taxes and free Wifi Internet Connection. The Standard Room is offered with two twin-beds or a queen-size bed , with a balcony at the rear of the hotel, offering views to the back street. The room rate includes American buffet breakfast, all taxes and free Wifi Internet Connection. 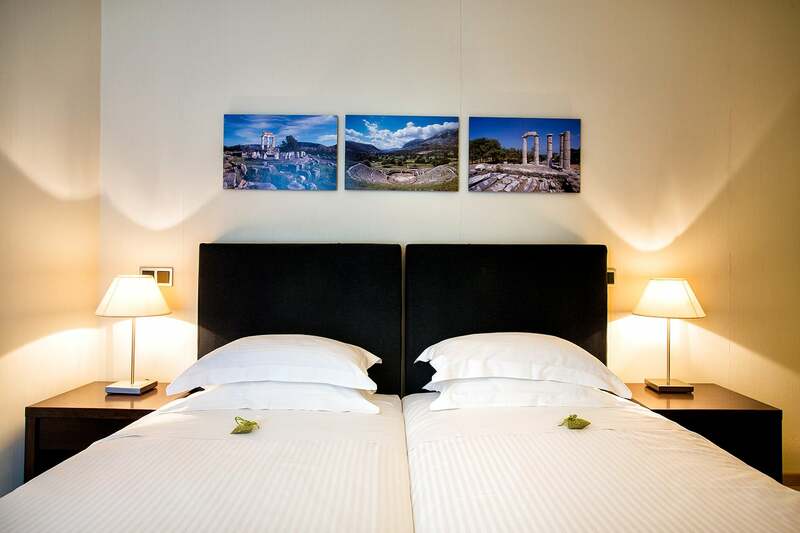 Our Superior Rooms are offered with two twin-beds or a queen-size bed, and feature a balcony with a view to the Temple of Olympic Zeus or the Acropolis. Rates include an American buffet breakfast, all taxes and free Wifi Internet Connection. *Rooms with Acropolis view are offered on request basis and upon availability. 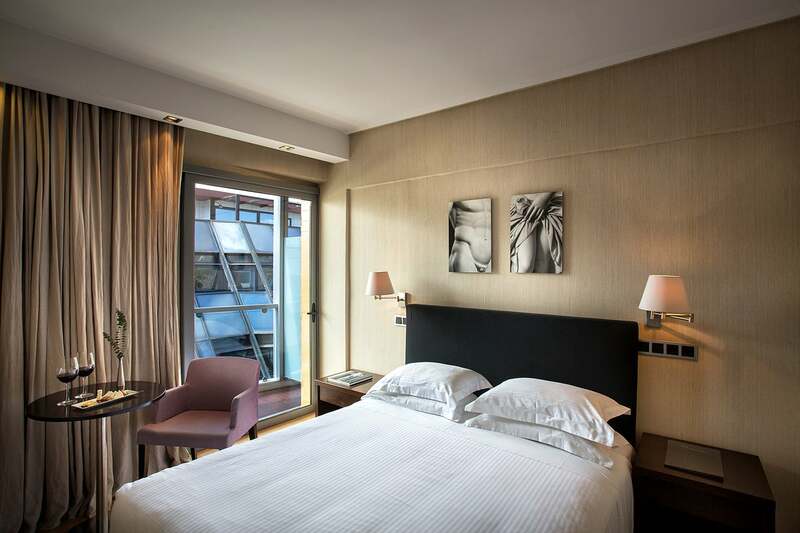 Located on the 7th floor of the hotel with queen-size bed, this room opens to a large furnished terrace, overlooking the Temple of Olympic Zeus or the Acropolis. *Rooms with Acropolis view are offered on request basis and upon availability. The room includes American buffet breakfast, all taxes and free Wifi Internet Connection. Offered as an ideal solution for families with two adult kids, this type of room consists of 2 Superior Double rooms with an interconnecting door, one with a queen-size bed and the other with two twin beds. 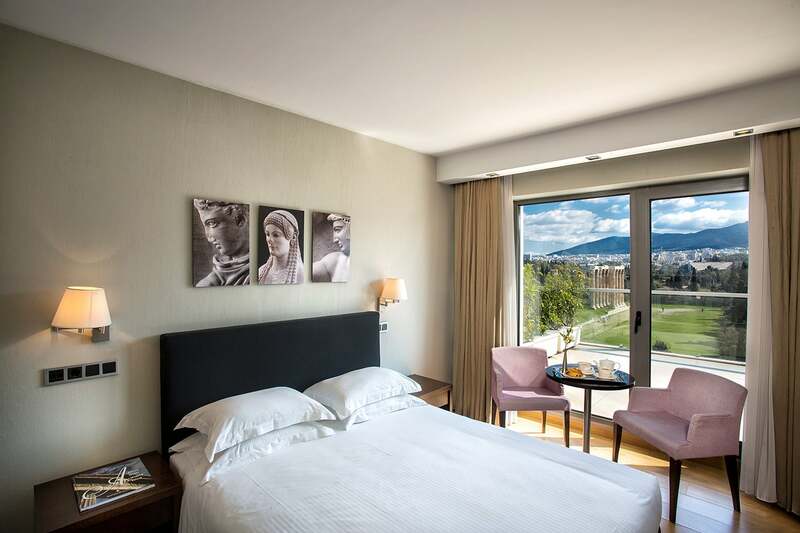 All rooms have a balcony with views to the Temple of Olympian Zeus. The room rate includes an American buffet breakfast, all taxes and free Wifi Internet Connection. 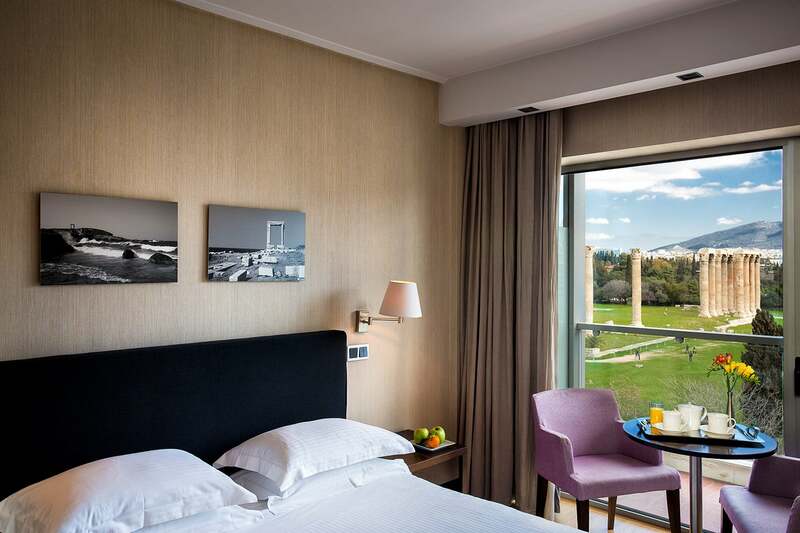 This spacious suite offers a queen-size bed, a sitting room and a panoramic furnished terrace, with views over the whole city, the Temple of Olympic Zeus, the Acropolis and Lycabettus Hill. The suite includes a bathroom with bathtub/jacuzzi and shower. Optional extra bed (suitable for under 16-year-olds). Rate includes an American buffet breakfast, all taxes and free Wifi Internet Connection.